When the temperatures start to rise, I start to look for light lunch and dinner options. I am not a fan of foods that are going to weigh my tummy down and make me feel bloated and sluggish. As much as I love my southern comfort foods, they really aren't a good fit for this time of the year. Instead, I reach for a lot of fresh fruits and veggies (especially the ones I grow in my own garden) to satisfy my hunger in the summer. That's why I love to keep a huge container of mixed greens in my fridge during the hot months. There are so many ingredients you could add to the mix that even if you had a salad to eat every day, it would be hard to grow bored with it since you could just toss in something different every time and feel like you are getting something new each time. 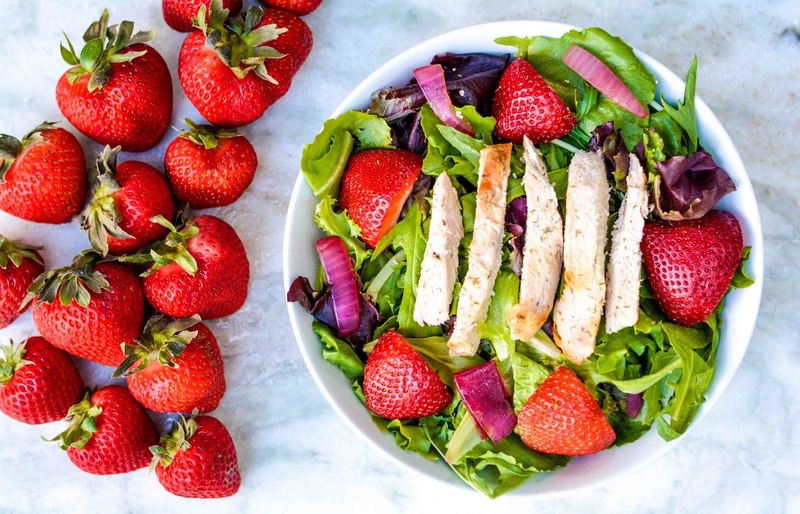 Last week I made this Strawberry Chicken Salad recipe from Golden Blossom Honey for dinner and it was a huge hit with the family. I always love to add fresh fruits to my salads because they always pair well with a good vinaigrette. Since you make your own dressing with this recipe, no extra vinaigrette is necessary. You get a burst of sweet summer flavor with every bite. What are some of your favorite fruits and veggies to add to your salad bowls? I'm not the one to mix fruit with savoury food, no thanks :) You may serve me those strawberries with some whipped cream and honey, please! Strawberries in salads are my fave. I think they pair best with greens. Though admittedly I am a salad nut and could eat one every single day and never get tired of it. :) This one looks yum! Now I would never have thought of using strawberries in a chicken salad but what a delicious idea, I will have to give it a whirl next time. That looks so yummy! I'm a huge fan of salads with fruit. I love adding in that sweet element. Time to get my salad on! I love the combination of chicken and strawberry on a bed of greens. That sounds really good. Fruit is a classic addition to any salad, and I love that little bit of extra sweetness you kicked in with the honey. Nice. There is something about fruit in salad that makes me think of summer. This strawberry salad looks like something I would order at a nice restaurant. I am glad I am not the only one who eats lighter in summer. That chicken and strawberry looks so good and a combination I would not have thought of. Spinach, strawberries, feta cheese, slivered almonds and a balsamic vinaigrette is my favorite! Yum! Looks healthy to boot! I'm not sure how will I enjoy the mix of sweet and greens! This salad looks really good! Would be a perfect lunch idea on a busy day! I love adding chicken to my salad, it's healthy and it's a better choice instead of beef or pork! It's perfect with veggies too. This is a lovely recipe! Looks really good! I love strawberries in a salad. It gives the salad an interesting kick to it. Chicken strips was also a nice addition. That makes the dish not just a salad but a complete meal in itself. I love summer and salads and strawberries! Cannot wait to try this. We are on vacation next week and i'll be trying this out! strawberry and chicken! Great combination that I'd like to try, Theresa.. This looks so good and it would be nice to have it during the summer! Salads are refreshing and they don't require a lot of cooking (sometimes none at all!) which is why I love having them in the summer. Okay this looks so tasty and I was just about to gohave lunch. I HAVE ALL THESE INGREDIENTS IN THE HOME SO GUESS WHAT i AM GOING TO EAT! Yum Yum. I'm off to try this! Love to see those colors on my plate. And honey makes it even better! Warna strawberrynya bikin ngiler. Love it! Apalagi ternyata bisa di-mix dengan ayam juga ya. Wow!